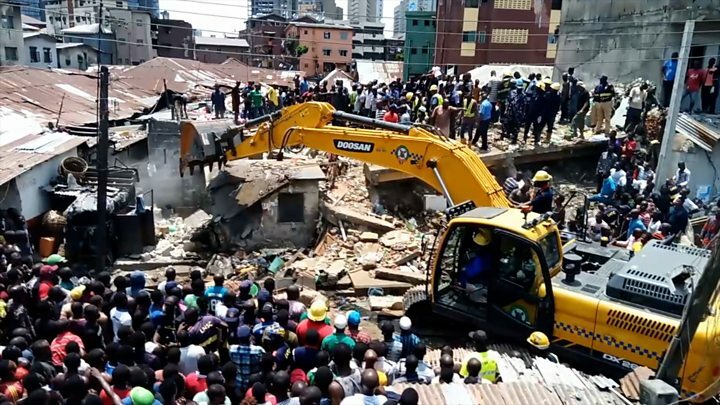 NIGERIANS, last week, witnessed another avoidable tragedy when a three-storey building housing a nursery and primary school and a shopping complex, collapsed at Ita-Faaji on Lagos Island. About 20 people, many of them schoolchildren, died in the incident while several others were wounded. The Ita-Faaji building collapse has exposed, once again, the poor state of some buildings in the state and the inability of the relevant government agencies to effectively enforce building regulations. We believe that the Ita-Faaji incident should serve as a wake-up call on the building authorities to address the recurring problem of building collapse across the country. Government must urgently put measures in place to curb the menace. Barely three days after the Lagos incident, a three-storey building collapsed in Ibadan, Oyo State capital, with scores of people wounded. But the Ita-Faaji incident is a timely warning on the government to begin to address the issue of using quacks and substandard materials in the construction of buildings. We recall the 2014 collapse of a building at the Synagogue Church of All Nations in Lagos that led to loss of many lives. Also, in 2017, a four-storey building collapsed on Lagos Island in which eight people died. However, building collapse is not limited to Lagos. It had occurred in Kano, Abuja, Onitsha, Aba, Uyo, Port Harcourt and other towns in the country. It is good that the Lagos State Government has set up a five-man panel to probe the immediate and remote causes of the building collapse. The panel, according to the Lagos State Commissioner for Physical Planning and Urban Development, Rotimi Ogunleye, will determine the level of negligence on the part of the developer or owner of the building as well as the role of the state government. Moreover, Governor of Lagos State, Mr. Akinwunmi Ambode, has ordered landlords and developers whose property were already marked for demolition in the state to immediately comply with the directive or risk forfeiture of such buildings. Also, the Lagos State Building Control Agency (LASBCA) had begun the demolition of about 149 defective buildings. We enjoin the officials entrusted with the demolition of the defective buildings to comply with the directive. We say this against the backdrop of reports that the collapsed building at Ita-Faaji had earlier been marked for demolition but was allegedly spared until last week when it collapsed. It is possible that the Ita-Faaji building may not be the only one spared as a result of this negligence. The reluctance of some building officials to enforce building codes is public knowledge. We urge the government to ensure that any defective building is promptly demolished. To stem the incidence of building collapse, all property developers in the country must make use of qualified professionals in the construction of buildings instead of using quacks. The authorities in charge of building should enforce extant building codes and regulations. We urge the Lagos State government to set up a Task Force that will ensure that only landlords and developers with building approvals are allowed to develop their property. We believe that doing this will reduce, to a large extent, the increasing cases of collapsed buildings in the state. Government should also embark on massive and sustained enlightenment programme that will address the inherent risks of building without following stipulated regulations. While we condole with those that lost their loved ones in the Ita-Faaji incident, we wish those wounded speedy recovery. Above all, let the government find pragmatic measures to minimise cases of building collapse in future. We advise all state governments to come up with measures to curb the frequent collapse of buildings in different parts of the country. Let them see the recurring building collapse as a serious national problem that must be quickly tackled before the collapse of another building.